I went overbudget. Way WAY OVER. As in, I spent almost half again as much as I had budgeted. I budgeted $450 — a figure, admittedly, I picked at random, but it turns out it’s only slightly more than the average cost for a family our size (two adults and 7-year-old) on the “Thrifty Plan” according to this USDA chart. However, last month, I ended up spending slightly more than $600 (still more than $100 less than the “Moderate-Cost Plan,” which makes me feel a bit better). I know exactly how I ended up going overbudget: multiple trips to the nearby-but-somewhat-overpriced supermarket. Trips during which I also tend to go, well, as long as I’m here, I’ll get this, too… and that thing… oh, hey, they have those things I was thinking about… hmm, do I need that? I’ll get one, just in case… Yeah. In retrospect, why am I even surprised we I spend so much? Seeing as publicly committing myself to doing all the laundry last month made me actually do it, I’ve decided that this month, I’m going to keep track of all our household grocery purchases here. I’d like to come close to the $442 on the USDA’s Thrifty Plan and see if that’s a reasonable amount for us. Total so far: $6. Last night, my husband picked up two jars of spaghetti sauce (his go-to standard when it’s his turn to cook) and a jar of peanut butter. Meanwhile, I’m headed to the Greenmarket this afternoon for our fruit and veg of the week, which will probably add about another $20 to that (I’ll be giving between-post updates over on Facebook). Lastly, do you write out a month-long menu? 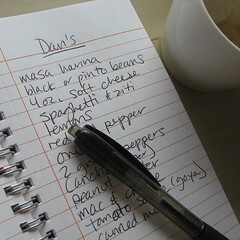 I’m trying to plan out a month-long menu this month, to see if that cuts down on unnecessary grocery store trips — let me know if you have any tips on making that work. Addendum, 3:30pm: Went to the Greenmarket and bought some carrots, a pound of onions, about 3.5 lbs of tomatoes, a bag of grapes and 5.5 lbs of apples for $15. So, current total: $21. In August we challenged ourselves NOT to buy groceries. Believe it or not we still had food in our cabinets on August 31st! I don’t think I would do it again BUT it was so nice not grocery shopping for a month. And oh, to give you perspective, my grocery budget use to be $650 (family of 4). I’ve gotten it down to $350. To get down to that $350/month we tracked what we were buying at the grocery store for a few months and made decisions based on that data. For instance, I was spending almost $50 a month on alcohol. When I saw that I realized I didn’t want that much $ going there! I didn’t cut out drinking out completely but I cut back and I only buy the wine on sale. We (my husband) does menu planning before he shops and we have a few standards we eat every week. Oh, man, that figure does NOT include take-out and/or coffees. We’ve been hitting up the Chinese place more often than I would like to admit lately, which makes the fact I spent so much on groceries even more insane. I don’t think I could plan out a whole month of meals. When we’re not getting our CSA box, I do a weekly plan, which seems to work out pretty well. ‘Course, I do need to occasionally do a week of from-the-pantry-and-freezer meals ‘cuz I tend to overbuy sales/staples sometimes. This is my sticking point as well. I usually go to the Greenmarket, buy what looks good and is cheap, THEN make a menu based on what I’ve bought.